Know a great business? Nominate it for the 2018 Business Awards. ​Deadline is Oct 27, 2017. The nominee does not have to be a member of the Richmond Hill Board of Trade at the time of nomination BUT they have to join the RHBOT within 30 days of the nomination to be eligible to win the award. These awards recognize outstanding achievements in some or all of the following: Company Growth, Customer Service, Market Development, sales and Marketing, Community Service and Innovation. Recognizes a company owner – operator under 35 who has a leadership role that meets the criteria and eligibility requirements stated in this form. Recognizes a company that either creates a new product or service that significantly improves current processes, technology or design. Recognizes businesses that exemplify professionalism and integrity. This category includes, but is not limited to: law, medical, dental, accounting, financial, insurance, real estate and other professional service providers. Recognizes a business: hotel, motel, bed and breakfast, entertainment venues, theatre, and restaurant/eatery that provides excellence in quality and service to their customers. Recognizes a registered non-profit/charitable organization which has shown exceptional community service and leadership including but not limited to: Broadened Education of Service; Innovative Services; Sustainable Business Model; Promoting Volunteerism; Positive Contribution to Society; Social & Community Advancements. Recognizes a business that provides products or services in information technology, software or web development. This award is open to any successful business that does not fit into any of the categories listed above and has proven excellence in the community relations, business achievement, sound employee relations, customer service and reliability. This award is open to any Richmond Hill Board of Trade volunteer who has shown exceptional dedication by investing their time and resources in the organization. The winner is chosen at the discretion of the Board of Directors. i. Have a tangible business since January 2015.
ii. The nominee does not have to be a member of the Richmond Hill Board of Trade at the time of nomination BUT they have to join the Board within 30 days of the nomination to be eligible to win the award. iii. Businesses that have won a RHBOT Award in the past 5 years are not eligible to win. iv. Any nominee who has won a Chamber or Board of Trade Award in York Region in the past 2 years is not eligible, UNLESS, they have been a member of RHBOT since January 2016.
v. While it is not encouraged, businesses can self-nominate. vi. The competition is also not open to the Judges or their employers, to members of the Award Organizing Committee or their employers, or to the Board of Directors of the Richmond Hill Board of Trade or their employers. vii. At the discretion of the judging committee, awards may be withheld in any category. viii. Businesses may be nominated for more than one category. The Judges will have discretion to determine the category under which the business will be judged. 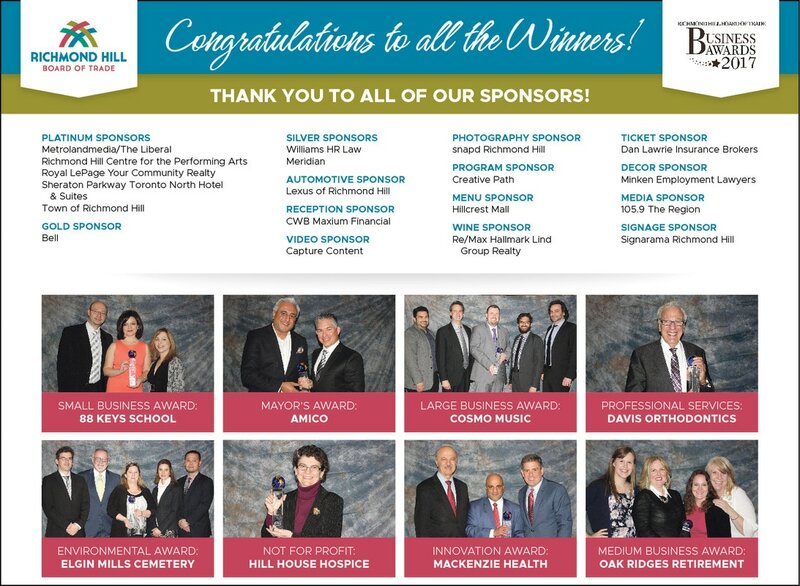 Winners (except for Lifetime Achievement Award) are selected by a panel of judges made up of past winners of Richmond Hill Business Awards, business leaders, Town of Richmond Hill representatives etc. Their selections are based on a pre-determined marking scheme.